If you've read my previous posts on BBQ Chicken, you probably already know that I've never been a big fan. A couple years back, I got into a slight disagreement with a fellow blogger on how this was not really B(est) of the B(est) Q(uality). I found the chicken to have a bit of a fishy smell and am not a big fan of the batter either. Still, when I saw that BBQ Chicken had new ownership and was now open for lunch, I thought "why not try it again".....hey, maybe my tastebuds had, ahem, "matured enough to appreciate the chicken". Or maybe you just need tastebuds that are super mature, i.e. dead, to really enjoy the chicken, in which case there would be no change. What was nice was that I was actually acknowledged when I arrived, by a very nice young lady. 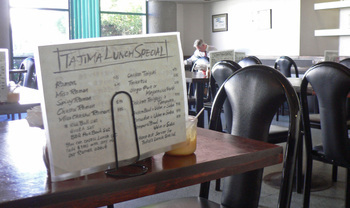 Looking over the menu, I noticed that the lunch specials were nicely priced. Hey, even better......so I ordered a three piece "Olive Luxury Chicken Combo" ($7.99). On the good side, the chicken was very moist...and hot! But I'm still not a fan of the bland, crumbliy, somewhat greasy batter....and for some reason, it still smells a bit fishy to me. It could be that I'm just more sensitive to it, but there is something strange in the smell. You get one side with the lunch and I chose the "corn salad", which was really bland, but at least didn't smell bad. As for the Chicken......well, I'm still not sold. Seven years is a fairly long time. I'm trying to think what was going on back in 2005.....it sure was a different landscape back then, social media was in it's infancy, we thought Flickr was the best thing since sliced bread...it was "BiP"....."Before iPhone". And that was also the last time I'd eaten at El Zarape. This was before I'd eaten at all those lonchera's, before I'd experienced birria, before I'd had decent mariscos. I couldn't help but wonder how El Zarape as aged over those years. Curiousity warranted a visit. I was pretty pleased to see that EZ's loss leader, the fish taco is still 99 cents, the same price it was when I first ate here in 2001. El Zarape makes up their profit margin with their other menu items. I decided to have a scallop and shrimp taco ($3.25/each) here as well. The scallops seemed kind of sparse and were really bland and rubbery.....it doesn't even stand up to the tortilla in flavor. Not a good value at over three bucks as well. I've always enjoyed the shrimp at El Zarape, so I wondered how that would be. I counted six shrimp, which looked like 41/50, maybe about 2-3 ounces. They were nicely browned on the griddle, moist and tender. Decent shrimp flavor.......maybe better than I had back in '05, though that was a looooong time ago. I'm hoping not to take another seven years before I'm back at El Zarape. Thought it's been far surpassed, they're still truckin' along and they still have a faithful neighborhood following. A couple of weeks ago, I made one of my rare trips down to the Gaslamp and decided to stop by Bolillo Tortas, which has been getting some good play on some of the local blogs. I'd heard that they made a Torta Ahogada with birote (aka bolillo) from Guadalajara, which got my interest. The place is pretty easy to find, right across the street from the Horton Grand Theatre on 4th Avenue. I liked the sleek and modern look of the restaurant. The gentleman behind the counter was very polite and prompt. The prices looked like it had the Gaslamp mark-up and then some...... nine bucks for a Torta Ahogada seemed a bit more than steep. Even though it was pretty early in the morning, about a half past eight, I thought why not just go ahead and get the ahogada....hot sauce be damned. When I ordered, the guy behind the counter asked me to wait for a second to make sure they had the proper bolillo for the sandwich. He then verified what I had heard, the bread did come form Guadalajara. Eventually, the birotes were tracked down, and after paying over twelve bucks for a sandwich and a drink I had a seat outside. Soon enough my sandwich arrived. It based on the looks and texture, instead of drowning the sandwich, the chile de arbol based sauce had been poured over the sandwich. Still it looked pretty good. So either this was a snack sized sandwich or that was the jalapeno that ate the Gaslamp wrapped in a belt sized slice of bacon. I'll let you guess which one it was. Still, if this was great, there would be no complaints. First off, the bread was kind of gummy, with a texture of the heat and eat genre. The crust was more hard than crusty. It was by no means as good as the bread that El Gallito uses. The sauce was pretty mild for my taste, but I can understand. The pork on the other hand was moist, tender, with a mild smoke flavor. It was also nicely seasoned. The bacon wrapped jalapeno was barely marked from the grill and both the texture and taste was raw. The bacon was barely browned and thus had a rubbery texture, which gave you the feeling you were eating raw bacon. The corn was tender and seasoned well with Tajin. Overall, a mixed bag, but I decided to return for a follow-up a week later. This time I went with the Torta Cubana ($9.75), usually a pretty hefty sandwich, which this was. This was probably too much stuff for me as everything got pretty much lost in a big sloppy mess. The cheese actually pretty much overwhelmed everything. If you've ever go through my posts on tortas you'll find that I'm pretty much of a single protein kind of guy. I still didn't care for the bread which seemed too doughy. Don't get the steamed vegetables which was very bland, even with the salsas provided. This time, the jalapeno and the bacon were charred and crisp, so perhaps I visited too early the last time. I don't think you'll go hungry with this sandwich. I really need to try the milanesa, chorizo, and other sandwiches. But I'm not sure how soon that will be. The service was very nice, but the prices are on the high side. When I mentioned this place to Karina, whose family is from Guadalajara, she sounded intrested. Until I told her the prices....."a torta ahogada should not be more than about seven bucks, max, US tourist prices even....."
I'm not sure why; but for some reason I'd been drawn to the "coming soon" sign in Plaza del Sol for some time. I really have no explanation for it........but something told me that this place wasn't going to be your typical Pho or Mi joint. A couple of weeks ago, I'd heard about a place opening on Convoy that made their own Banh Pho from scratch and thought "well that's nice.......". Visions of great possibilities doused by poorly a executed concept, a la Mignon Pho came to mind, so I tempered my expectations a bit. Still, it seemed like eons before I saw the Grand Opening sign for Nam An. And there it was....... Seeing Vietnamese dishes that I'd never had in San Diego before..... Peter was pretty shocked as well. This was the spiciest dish of the evening....it had some kick. I loved the watercress, though I don't think Peter and Angela were quite as fond of it. There was a bit left at the end of dinner, so I took it home to the Missus, a fan of watercress, who just loved it. About this time we had our first encounter with the very friendly and gracious Carolyn, whom I believe is one of the owners. She explained that the "appetizer" menu is only available from Thursdays to Saturdays, since she has to go to LA and Orange County to source what she needs. Thus, the menu changes every week, and they run out of items.... So no Muc Don Thit, stuffed squid...bummer. 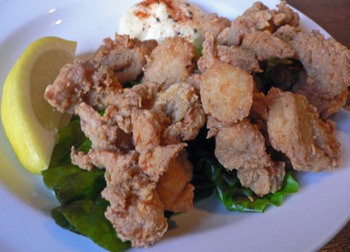 The Deep Fried Calamari was very tender and fried well, but no consolation. Next was the dish I'd been looking forward too Be Thui ($9), rare, almost raw veal, dusted with roasted rice powder. The Sea Snail Green Mango Salad ($6) was delicious..... man these snails must have been humongous. The snails were fairly tender, with a mildly buttery texture like large abalone. The green mango added a bit of a "tannic" - puckery feel to the dish, Rau Rama anise-pepper-bitter-mintiness. Rare Steak Marinated in Lemon, called Bo Tai Chanh ($4.50). Wonderfully tender rare filet mignon slight "cooked" by the acid in a fish sauce-lemon juice based sauce. Onions added a bit of bite to the dish, chilies a mild heat, the rau ram gave it a nice herbaceousness. Personally, I'd like this even more "rare", but it is quite good. If it sound scarey to you, and it shouldn't, think of this as being similar to Thai Beef Salads. The Bloody Clams in Tu Xuyen Sauce ($10) is a favorite of mine. The clams are small and have decent flavor, opening them are sometimes rather ponderous....but that sauce. I told Carolyn that I could lick the plate....she told me "no, there's no licking the plate here, I'll give you more sauce!" I believe the base of this Nuoc Mau, the basic Vietnamese Caramel Sauce, there's fish sauce, and also I believe garlic in these. It is a messy, sticky dish, that gives true meaning to "finger licking good"! You'll need to wash your hands afterwards, but it is well worth it. Seeing how much Peter, Ange, and I were enjoying our meal, Carolyn gave us some Oc Cha, some wonderfully flavored snail based "sausage". The snails added a nice toothsome sweetness to go with the smokey flavor of the leaves it was steamed in. We left quite satisfied, this is well prepared Vietnamese "beer food". After being married for a while I have a good idea of the Missus's taste preferences, so I made sure to bring Her for a visit "stat". She loved the food and I think we have a new restaurant for our rotation. Carolyn told us that she "wants to serve good food with great ingredients." She would rather not have an item on the menu than serve a subpar dish. As the night wore on, I noticed that younger folk were bringing in their parents and grandparents.....a very good sign. This led me to ask Peter a question.....his Mom is a fantastic cook. I asked Peter if he'd bring his Mom, also a pretty finicky eater here. Without hesitation he said, "yes, of course....." I think that says quite a lot. And I still haven't gotten around to the Pho yet, have I? Currently, the "bar" menu is only available Thursday thru Saturday. mmm-yoso is not on vacation; Kirk is. Cathy will be playing His part on the blog today. ed (from Yuma) is unavailable. There is another new Mediterranean place near SDSU. It is East of College Avenue on the South side of El Cajon Boulevard. One of few places open late in San Diego (until 2 a.m Sun-Thurs and until 4 a.m. Fri-Sat), you'll see it if you are driving in the evening. During the day, you may not notice, since it is in a strip mall ( next to the check cashing place). Not very large, very clean, with an overhead menu...you order, pay, have a seat and your food is brought out. We started with a falafel appetizer ($5.95) (the online menu has changed). These were good. Now that I have had 'real' falafel, made with fresh (not powdered) chickpeas, I look for something superior to the falafel I consider to be the best. The falafel here come in second; I have to do more research. Falafel here are light on the interior, with a good garlic and parsley flavor, light yet crispy fried exterior and not greasy. Served with the fresh (lemony-light garlic) hummus on the plate, I have no complaints. The gyros plate, with a side of lentil soup (~$9). An excellent rice, Basmati, cooked with toasted angelhair vermicelli and gently flavored with turmeric and something making the rice taste buttery-rich and fresh parsley. The gyros meat was sliced thick and was excellent in taste and in portion size. The lentil soup. Oh. My. Goodness. Yes, goodness. There was some vermicelli in the soup and it was thick (in a good way) with lentils (both red and green) and vegetables. The deep, rich flavors made me want to be certain to just order this as a side next time I drop in. A combo plate with a beef Kufta kabob (~$9) and salad. The salad was fresh with cucumber, radish slices and red and yellow bell peppers and a good oil/vinegar/herb dressing. The kabob had a great flavor of spices. I think it was zatar (tarragon, sumac and sesame) but also tasted some cumin and maybe ginger...anyway, it was good, juicy, moist but not greasy. Both of the plates were served with a plate of plain (not baked here) pita bread. I have been on the lookout for a fresh baked bread, ever since going to Alforon with ed (from Yuma) and Tina and The Mister in December (hmm, one of us needs to post on that). This was just standard pita. However, all the other food was on the edge of excellent and all the food was very fresh. The Mister had ordered without any beverage, and I asked for a Turkish coffee ($2.50) to sort of have for dessert...The nice young lady ordered it from the Hookah Lounge a few doors down and brought it to our table. A very fresh, excellent cup of Turkish coffee. The website states they use the "freshest organic produce and meats available". The menu inside has breakfast items, and we will be going back to try those. Tea Garden. Fancy-ish beverages and really good snacks! Cathy is penning today's issue of mmm-yoso!!! The guys (Kirk and ed(from Yuma)) are merely writing things in their brains. Hi. The other day, FOY(friend of Yoso), Food Detective, asked me in a comment if I had been to Tea Garden. I haven't, even though I have driven by, parked in front of it, walked past it and knew it was there. It is on Convoy, at Engineer Road, across from China Max and sometimes has parking when no place else on that street of countless amazing restaurants has parking available. We decided to try a green tea float ($4.25). Green tea, strong brewed, over ice with vanilla ice cream floating at the top. Very rich flavored. There must be matcha powder in it. My standard Beverage of Indecision (coffee-tea-milk, no sweetener added) ($3.75)-no sweet at all. I could taste each of the three ingredients distinctively. Very nice. An appetizer of popcorn chicken ($3.99). 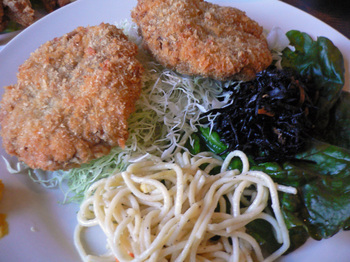 Crispy and moist, mild thin breading flavored with fresh basil leaves (on the plate) from the fryer. An appetizer of salt and pepper squid ($6.99) Soft squid, light breading topped with a relish of garlic, scallions and red pepper. Just enough heat. House Special fried rice noodle ($7.99). A wonderful smoky flavor infused in the thin noodles and perfectly sauteed shrimp, beef and chicken along with green onion tops, onions, carrots, sprouts and (I think) bamboo. Maybe it was a fungus. Those brown things...they had a woody texture and not much flavor. Lots of flavor in everything else. The other day (before this crazy heat wave happened), The Mister wanted soup. 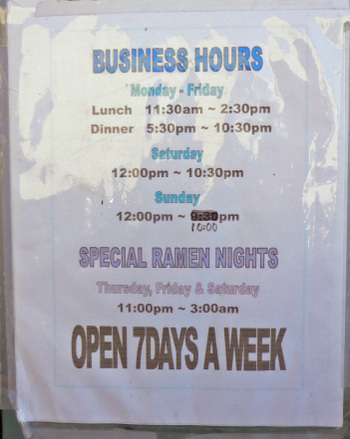 So we went back and He ordered the BBQ pork ramen ($6.99). This had a not salty, surprisingly rich broth, along with peas, carrots and cabbage as well as a few pieces of sliced BBQ pork (standard, not outstanding) and noodles which had a nice 'tooth',although not as good as the noodles at Yakyudori, my new favorite. I wanted to try the fried tofu ($5.59). When this came, I thought it looked like a thick, hard crust and was almost disappointed. Instead, I was pleasantly surprised at the delicate thinness of the coating and soft, soft fresh tofu inside. The dipping sauce was a very dark soy and sesame oil base and filled with chopped garlic, green onion tops and some red pepper flakes. Extremely complimentary for the tofu, and just the right amount of heat. I think if I had ordered the salt and pepper fried tofu (50¢ more), this dipping sauce would have been overpowering. All in all, the food here has been great. A pot of hot tea is $5.95. Other items on the menu I am wanting to try include a Hot Clay Pot, fried udon, fried rice, congee, sizzling steak, other soups, brick toast, shaved ice and something called "vinaigrette soup" ($5.95), either shrimp, pork or squid. Oh and juices, smoothies and...yes, more appetizer snacks. You can easily get a meal, the plates and bowls are a very good size. Thank you Food Detective!!! This is a great place. Taste of Italy- Rancho San Diego. A Sicilian influenced and excellent lunch. mmm-yoso!!! is the food blog you are reading. Cathy is writing because the guys (Kirk and ed(fromYuma)) are busy doing stuff, like researching future posts. Tucked in a shopping mall near Cuyamaca College, next to the Starbucks, in Rancho San Diego, is this. Taste of Italy, kind of a local chain of "A Taste of Italy" restaurants (another location is on University in Hillcrest, on Carmel Mountain Road in Del Mar and also Vesuvio and Etna are owned by the same group; the primary menu items are all Sicilian (a more complex Italian) based). We like the Rancho San Diego because it is open late (midnight M-Th and 2 a.m. on Fri and Sat), it has a bar, televisions in the bar (we watched a World Cup game here one Saturday) and really really good, house made food. Inside, there are a selection of wines, or you can bring your own and store the bottles, in a locked area with a personalized plaque, as you might on the island of Sicily. Artichoke soup. Made from scratch. Not heavy (no cream layer stuck to your tongue). Lemony and with a bit of heat (jalapeño juice maybe was in it). Excellent and made in house. There is always a great minestrone, I do like trying the soups. The island of Sicily has a subtropical climate and artichokes and eggplant and citrus are easily grown. Most Sicilian dishes are vegetable and seafood based). A few pieces of garlic bread were brought out- The garlic was complimentary to the soup taste. I ordered the Classic Antipasto for my meal. Red and green lettuces, fresh pickled mushrooms, tomatoes, onions, olives and rolled mortadella, salami and provolone. This was just the right amount of food for me at lunch. The house made olive oil, balsamic and herb salad dressing (also with a bit of peppery heat) is just right. The Mister could not decide, but knew he wanted a baked pasta dish and chose the half ravioli half cheese manicotti with the marinara sauce ($14.99). The pastas were tender, house made. The manicotti were very much like crepes and filled with a combination of mozarella, ricotta and romano cheeses. The ravioli were large and overfilled. The marinara sauce, also house made, was very rich in tomato flavor and had just a touch of red pepper heat in it. 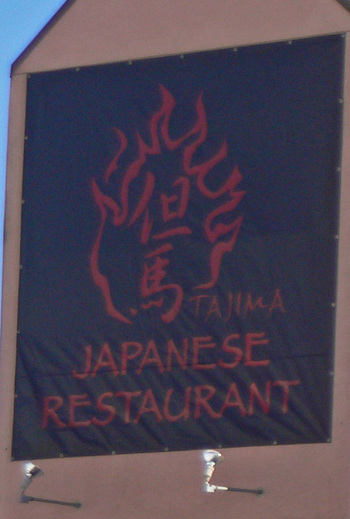 You need reservations on Friday and Saturday nights to eat here. It gets very crowded. Because it is good. There are plenty of Italian Restaurants in this part of El Cajon. This is one of the best. 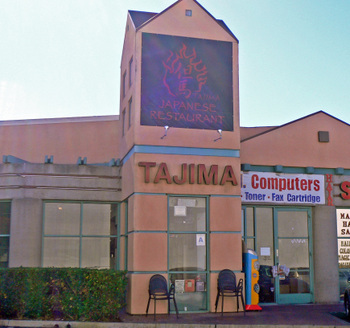 We've been going to Tajima since we first moved to San Diego back in 2000. I used to enjoy the Menchi Katsu(breaded deep fried ground/minced meat - in this case beef) Curry, now long gone from the menu, the various Ramen, and the Missus had always enjoyed the Okonomiyaki(a savory type of Japanese pancake). 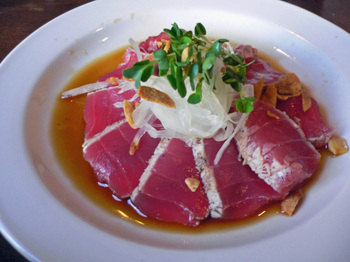 Since an Ownership change a few years back, the menu has been expanded to accommodate a large variety of Izakaya style dishes(think pub grub/tapas style dishes) and Westernized Japanese dishes. Since I've started to make Okonomiyaki at home, the Missus hasn't expressed a desire to eat at Tajima. So most of my visits have been for Ramen at lunch. 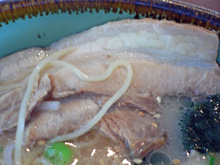 The broth for the Chashu Ramen is Tonkotsu style, which is the whitish long boiled pork bone broth. 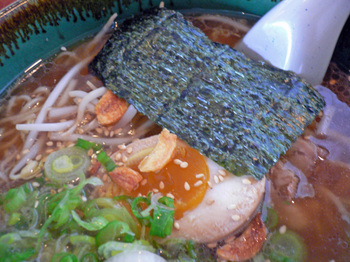 While not as rich and velvety (nor as oily for that matter) as the version from Daikokuya in Little Tokyo(Los Angeles), it is still the best version of Tonkotsu style broth that I've had in San Diego. Though the broth is much darker in color than almost every other version I've had, it is not overly salty, and on the mild side, with a nice amount of oil. The Char Siu on this visit were 3 slices of mildly flavored pork belly, accompanied by some slices of bamboo shoot, a boiled than marinated egg, bean sprouts, and a piece of nori. The broth is a mild Soy Sauce based broth to which I usually add a nice scoop of garlic paste, and some Shichimi for some zing. 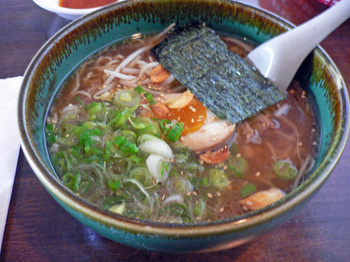 Speaking of the garlic paste; on a previous visit a gentleman with some obvious olfactory problems dumped 3 spoons of the garlic paste into his ramen....taking a sip of his soup, his eyes opened wide, exclaiming "Holy crap, this isn't mustard".....he-he-he. As previously mentioned...I love that boiled egg. 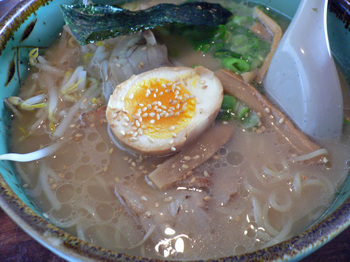 A nice hot bowl of Ramen on a rainy day, very few things better than that. 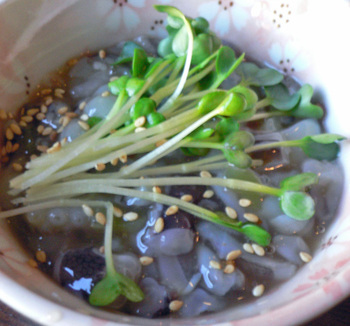 It's the Marinated Baby Squid($3.95), a salty-pungent-winey-slightly sweet offering, with a mild Shiokara-like flavor. The julienned basil added a nice clean flavor to this dish. On a recent visit I managed to drag the Missus along, and being quite hungry we tried a few of the appetizers, along with a main course. This was pretty good, more on the sweet side, than salty. The Missus enjoyed it, and even thought it was better than the version at Sakura! Looked fairly nice, but the fish was tough, the ponzu watery, and weak in flavor, and the fried garlic only added a bitterness to the dish. 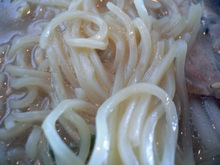 Hardly any miso flavor, and soggy noodles. The shrimp tempura was fine, nice and crisp. 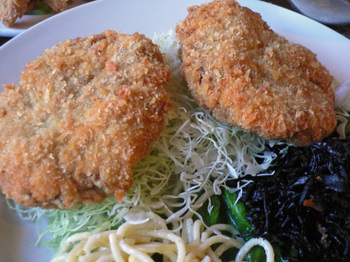 Aaaaah, minced meat, breaded, and fried, how can that be bad? Honestly, not a bad version, nice and crisp on the outside, and not oily at all. The patties had a good amount of filler which kept it moist, and the onion flavor came through. 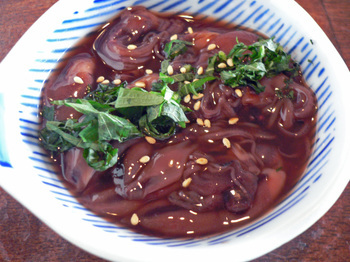 The "butter noodles" are not my favorite thing, and the Hijiki(seaweed) had not been cooked long enough and was like eating wood. The Menchi Katsu came with a bowl of miso soup(okay as miso goes), rice, and a combo Demi Glace - Katsu Sauce, that was too sour for my taste. Yep, open till 3am Thursdays through Saturday(Convoy location only). 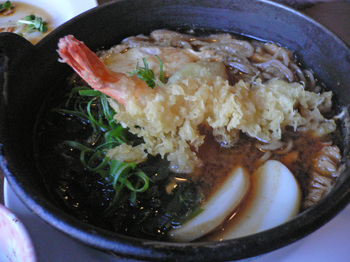 And it's a good thing; for now, I think I'll stick with the ramen at Tajima. Don't forget to try the Okonomiyaki!